LAGUNA HILLS, Calif. (BRAIN) — BRAIN's State of Retail panelists are selected to present a cross-section of retailers around the country. They generously volunteer their time to talk to us about a retail topic as we prepare each issue, 18 times a year. We choose new panelists each year. Deadline is Oct. 28; annual directory to include new distributor map. 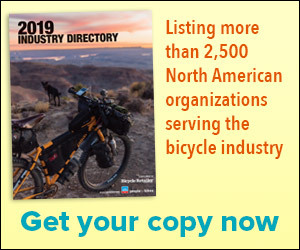 LAGUNA HILLS, Calif. (BRAIN) — Bicycle Retailer & Industry News and PeopleForBikes are collecting new listings and updates for the annual Industry Directory. LAGUNA HILLS, Calif. (BRAIN) — The newest Bicycle Retailer & Industry News issue — arriving in mailboxes and being distributed at Eurobike this week — features a look at Italy's bicycle industry, including a trend of some manufactures, like sunglass and helmet brand SH+, to return manufacturing to Italy after a few years of experiementing with Asian production. LAGUNA HILLS, Calif. (BRAIN) — The Brexit vote in the United Kingdom could make life difficult for U.S. bike industry suppliers who sell into the UK. Companies like Park Tool say the devaluing of the British pound makes their products more expensive there. The apparel department can be a profit center - it just needs the right mix of product, merchandising and placement to do its job. LAGUNA HILLS, Calif. (BRAIN) — Bicycle Retailer and Industry News is looking for retailers to participate in our 2016-2017 State of Retail panel. Retailers selected for the panel will weigh in on business-related topics affecting the industry. Responses are printed in each issue of the magazine. New issue also examines Canyon's impending arrival in the U.S., and Shimano's pricing changes. LAGUNA HILLS, Calif. (BRAIN) — The June 15 issue of Bicycle Retailer & Industry News, landing in mailboxes and email inboxes this week, features our annual e-bike report, a 12-page package devoted to the fast growing market for electric bikes. Montréal Dealer Tour: Service, service, and service. And coffee. MONTRÉAL (BRAIN) — David Bryson has been a specialty retailer since the 1980s, first riding the windsurfing craze from boom to bust and then running a well-regarded ski shop that sold Specialized bikes in the summer. MONTRÉAL (BRAIN) — On our first day touring bike shops in this proud and historic city, the BRAIN Dealer Tour saw a mature market and riding community, with stable, long-standing retailers who serve passionate roadies, commuters and adventurers. LAGUNA HILLS, Calif. (BRAIN) — Nominations are now being accepted for two of the six retail categories for the IB Awards to be presented at the third annual Interbike Awards Gala. LAGUNA HILLS, Calif. (BRAIN) — The latest BRAIN print issue looks at first-quarter inventory levels, the national growth in cycling infrastructure, and Electra’s move into an expanded softgoods and helmets line, among other stories.